Land for the Tifereth Israel Cemetery, located in Mount Carmel Township, was purchased January 16, 1908 (County deed book #149, page 136). 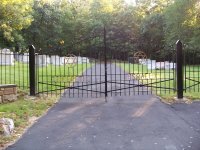 The original size of the cemetery was 100 feet by 150 feet. An additional 7500 square feet was purchased June 28, 1951. This additional area has not been developed. It is to the right of the developed cemetery (County deed book #345, page 313). Around 1887 a small group of Jewish families organized the first Hebrew services in Mount Carmel, Pennsylvania. The services were held on the third floor of the old Post Office Building located at the northwest corner of Fourth and Oak Streets. This building was later the Woolworth Building and presently the Rite Aid Store. The Hebrew Ladies Aid Society was formed in 1920. 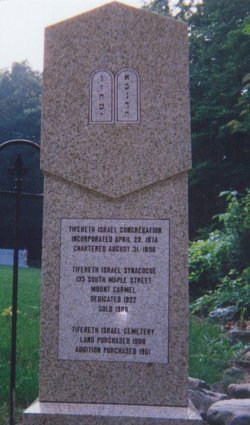 Tifereth Israel Synagogue was incorporated August 4, 1896. Six trustees were Simon Kornosky, Harry Halberstam, Isaac Rosenberg, Solomon Rabinowitz, Max Dorewicz and Henry Martin. (Recorded in the office for the recording of deeds in Northumberland County, charter book #2, page 7). As the community grew, they were able to build a synagogue. The first president was Simon Smigelsky and the first rabbi was Rabbi L. Rabinowitz. Rabbi Rabinowitz taught Hebrew in his home after public school hours. Rabbi who have served Tifereth Israel; Blachorsky L. Rabinowitz, Arthur Oles, Ephraim Solomon, Louis D. Wein, Shlomo Morrow. Some of the pioneer residents who made up the Congregation were Simon Smigelsky, Joseph Coplan, Louis Peril, Frank Silverman, Daniel Fisher, Solomon Rabinowitz, Louis Grossman, David Unger, Joseph Levine, Simon Karns and Nathan Cohen. In 1922, a synagogue was built at 135 South Maple Street. The officer and members at the time of the dedication were: Joseph Levine, president, H.J. Grossman, treasurer, Lewis Cahn, secretary, Nathan Cohen, A.H. Douglas, Sol Grossman, Louis Feinberg, S. Smigelsky, J.T. Liachowitz, Louis Grossman, Sam Spector, Frank Silverman, Max Coren, Louis Mason, L. Peril, Max Miller, Joseph Coplon, Israel Saluda, Simon Saluda, G.A. Spector, Phillip Lippman, Sam London, Morris London, Simon Karns, Max Yoffee, Morris Schlenger and B.A. Friedman, members. Family names in addition to the above mentioned who contributed to the building fund are August, Bloom, Cahn, Feinberg, Hirsch, Katz, Michelson, Riemer, Roberts, Strauss, Unger, and Wolf. The synagogue flourished for many years, but with the decline in the anthracite coal mines and the textile industries, the population dispersed. The synagogue building was sold April 11, 1986 and now serves as the Masonic Temple . Additional families who were at one time members of Tifereth Israel from the 1940's to 1980's are: Bloch, Bronstein, Edelson, Hech, Levin, Nelson, Pearl, Rapoport, Riess, Zabitz, Cantor, Eisen, Forman, Handshu, Heller, Goldberg, Levinson, Lipshitz, Marateck, Matlow, Rabbi Morrow, Moskowitz, Paul, Reiss, Shapiro, Silverstein, Smigel, Solomon, Sparber, Stern, Ufberg, Unterberger, Walker, Weinkle, Weisbond, Weisman, Wisansky, Wishkin, and Wolfe. The first Bar Mitzvah in the synagogue was "Affa" David Spector in 1922 and the last Bar Mitzvah was Louis M. Matlow on May 20, 1978. There are presently no Jews living in Mount Carmel. The last Jewish resident died in 2006. Two Torah scrolls were sold to the Chapel of Martins Run, a Jewish oriented life care community in suburban Philadelphia, Pennsylvania. One Torah was sold to Sandy Swickler of New York: another to Sol Halpert Banner of Elk, NC. Other items were bought by collectors and dealers: Chris Lancaster of Minersville, PA, Dr. Gerald Ravitz of Schuylkill Haven, PA and Michael and Maxine Kam of Philadelphia PA. The siddurim were donated to The Roslyn Synagogue in Roslyn Heights, NY. 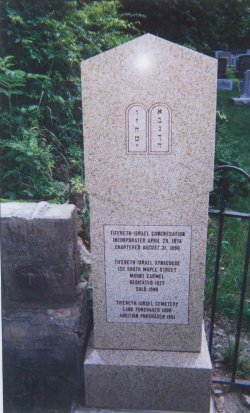 Other items including the Yahrzeit tablets were given to the Eastern Pennsylvania Jewish Museum, presently maintained in Oheb Sedeck Synagogue, Pottsville, Pa. Historical information compiled by Ted Matlow Submitted by Miriam Oles, daughter of Rabbi Arthur Oles.